March 6, 2017 | March 6, 2017 | Pooja Motwani, M.D., a University of Arkansas for Medical Sciences (UAMS) hematologist, has been appointed to the American Society of Hematology’s Scientific Committee on Lymphoid Neoplasia. The committee helps define the society’s research and policy agenda for hematology as well as recommends scientific session programs for the society’s annual meeting. Motwani’s four-year term began January 2017. Motwani is an assistant professor in the Department of Internal Medicine, Division of Hematology, in the UAMS College of Medicine. She is also an oncologist at the Winthrop P. Rockefeller Cancer Institute, where she sees patients, and co-director of the Sickle Cell Program at UAMS. She is the principal investigator on several clinical trials for lymphoid malignancies. 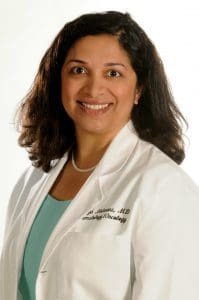 Motwani received her medical degree from Grant Medical College in Mumbai, India, and completed her residency in internal medicine at Mount Sinai School of Medicine in New York. She also completed a fellowship in hematology and oncology at Baystate Medical Center at Tufts University School of Medicine in Springfield, Massachusetts. Motwani is American board certified in internal medicine, hematology and medical oncology. She is a member of the American Society of Hematology and the American Society of Clinical Oncology.